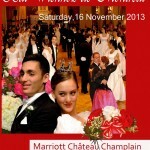 The ball took place on November 22 at 7.00 p.m. at the Hotel Marriott Château Champlain under the distinguished patronage and in the presence of the Austrian Ambassador to Canada, Arno Riedel. Guest of honour was McGill University Principal and Vice-Chancellor Dr. Suzanne Fortier. The new Honorary Consul General of Austria Marc Bissell attended for the first time. 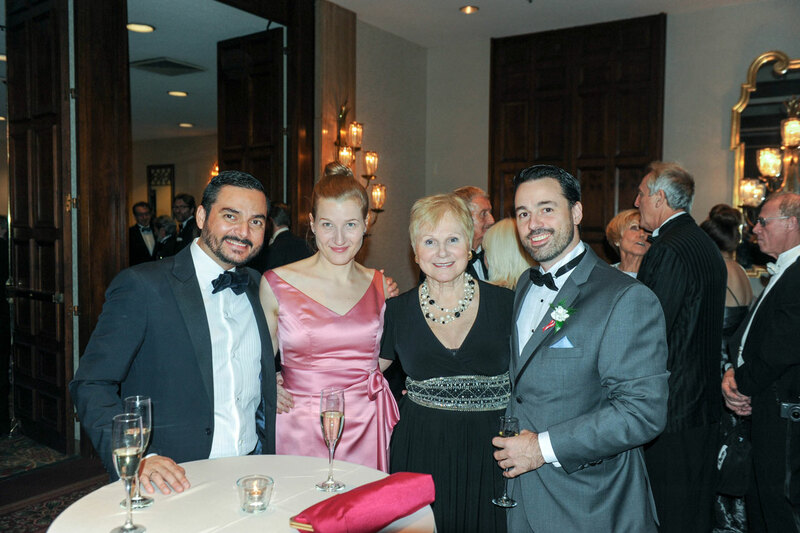 The Ball opened with an Austrian Champagne (“Sekt”) reception while arriving guests were serenaded by violins playing Austrian waltzes. Head Table guests entered the ballroom to the tune of the Radetzky March by Johann Strauss Sr. Internationally known soprano Kimy McLaren with Schulich School of Music and Opera McGill singer baritone Dan Bevan-Baker sang the national anthems before being joined by Chelsea Rus also from Schulich to perform an opera scene from ‘Die Fledermaus’ by Johann Strauss Jr –piano accompaniment by Patrick Hansen, Head of Opera McGill. The 16 debutantes in identical white gowns and glittering Swarovski coronets, were officially presented to the Ambassador and Ball President before performing their opening waltz to the tune of Johann Strauss Jr.’s ‘The Blue Danube’. Followed the traditional call of “Alles Walzer” – “Everyone waltzes”- which had everyone twirling to Strauss’ ‘Wiener Blut’. The Harold Birkens Orchestra, alternating with the Edelweiss Trio played music for traditional and modern ballroom dancing until 2.30 a.m. A very special touch during the speeches was a talk by former SOS Children’s’ Villages resident, Divine Usabase of Burundi who is now a McGill student on full scholarship. Music by strolling musicians added a special touch to the 5-course gourmet dinner, based on Viennese classics and contemporary fusion cuisine. The Grand door Prize – two plane tickets to Vienna’s neighboring city, Prague, courtesy of Air Transat was won by long time guest Jason McCallum. Bidding was active at the Silent Auction, open throughout the evening and the Casino was jumping all night with super prizes being drawn every few minutes. The evening continued at the rustic Heuriger wine tavern from midnight to a record 3.30 a.m. serving Austrian Goulash soup, sausages, beer and wine and featuring lively Viennese music and songs with guests performing. Dance for others. 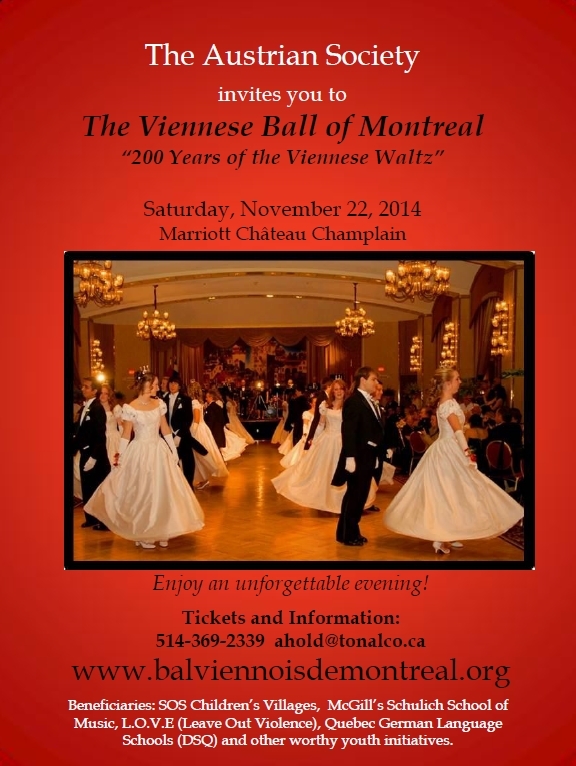 As in previous years, all proceeds from the Ball went to deserving causes related to youth initiatives. The primary beneficiary was, as always, SOS Children’s Villages, the largest orphan-focused charity in the world, founded in 1949 by an Austrian doctor to help children who lost family and home in the war. The Schulich School of Music of McGill University was also an important recipient in the form of bursaries for the study of music in Austria. 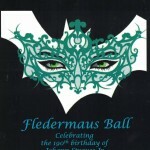 As in previous years, this year’s ball also supported Leave out Violence – L.O.V.E. – the leading youth violence prevention organization in Canada, and DSQ (German Language Schools of Quebec) which offer German courses for all ages.